Make sure your dog has a bucklestyle collar with current ID tag. No more than two fingers should fit between the collar and your dog’s neck; otherwise, s/he can slip out of it. The ID tag should have your last name, city, state and two mobile phone numbers. I avoid putting the dog’s names on tags (security). On the back, I also put: NEEDS DAILY MEDICINE, my vet’s name and phone. You’re more likely to get your dog back if people think s/he needs medicine. I use tags from www.BoomerangTags.com - double-sided plastic ones. Use a standard six-foot lead. You have far less control over your dog with retractable/flexi leads. Leave those at home, or better yet, just throw them away. A regular lead has a loop for over your wrist, so you still have hands free to scoop, or hold other items. If your dog is too large to be crated for car travel, or there are multiple dogs (as in my case), keep them leashed in the car. Even better, use a harness that attaches to the seat belt. Years ago, I witnessed a car accident. A dachshund (unleashed, uncrated) escaped. It would have been much easier had he been on leash - and far less risk to those of us trying to help, as he darted through traffic. We got him to safety. When we do a transport for rescue, the dog is crated. If this isn’t an option, two six-foot leashes are used: one clipped to a harness with ID, the other clipped to the collar with ID. Always best to err on the side of caution. I cringe every time I see an unsecured dog hanging out a window, or worse, loose in the back of a pickup. This past January, Senator Greg Steube introduced SB 320: Dogs in Vehicles; Requiring a person transporting a dog in the open bed of a pickup truck or an open area of any vehicle or trailer to keep the dog within certain secured containers or securely tether the dog; preempting to the state the regulation of the transportation of dogs in motor vehicles, etc. Effective date: 1 July 2017 Your dog may very well enjoy the sights and scents, with head/front feet out of the window. But dust, particles of sand, or bugs can permanently damage eyes, especially while the vehicle is moving. Years ago, a friend’s mastiff spotted a squirrel and jumped out of the slowly-moving car. “He always travels (unleashed) with the window wide open. Nothing like this ever happened,” she said…. Well, until that day. Thousands of dollars, hydrother apy and many tears later, his broken shoulder recovered; but he was never allowed to stick more than his nose out the window. This expensive, traumatic lesson could have so easily been avoided. Think of your dog as a toddler. Restrain them for their own (and your) safety! Pack a container and water for your dog. Bring extra towels and shampoo, in case your dog goes for a swim. Have a first aid kit and use sunscreen on your dog. Be extra attentive to black and dark colored dogs (they absorb more heat). If the pavement/surface is uncomfortable to your bare feet or the palm of your hand, it’s even hotter for your dog. Be mindful of heat exposure and do not overdo it outdoors. Wishing you and your dog(s) safe travels and happy summer memories. Bone Voyage and dogspeed. 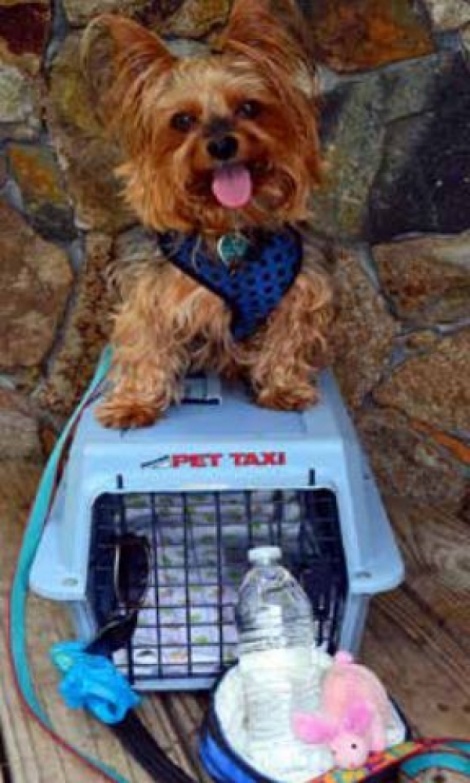 Sebastian (Tina’s rescued Yorkie) is ready to go! He’s wearing his buckle collar with ID and harness with standard lead. He’s bringing his travel crate with blanket, favorite toy, water, doggy bags... and even some sunglasses!